Sorry for the looooong title! 'Café Society' will officially open the Cannes Film Festival on May 11, and will also be released on May 11 in France (previously announced for October). Below you have the official statement, but also the official synopsis (yes!) and the very first still & behind the scenes picture, in UHQ. 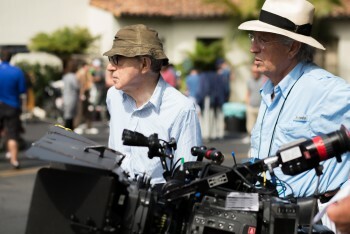 • Festival de Cannes: Woody Allen's Café Society to open the 69th Festival International du Film. The 69th Festival International du Film de Cannes will launch with a screening of Woody Allen’s new film, Café Society, on Wednesday 11 May in the Palais des Festivals’s Grand Théâtre Lumière as an Official Selection Out of Competition title. It’s a record-breaking coup for the New York director who has already opened the Festival twice, in 2002 with Hollywood Ending, and again in 2011 with Midnight in Paris. Café Society features two rising stars from Hollywood's up-and-coming generation, Kristen Stewart and Jesse Eisenberg alongside a stellar cast of acclaimed actors including Blake Lively, Parker Posey and Steve Carell. Stewart climbed the Red Carpet Steps at Cannes in 2012 for On the Road by Walter Salles and then in 2014 for Olivier Assayas’s Clouds of Sils Maria, which earned her a César. Jesse Eisenberg starred in Louder than Bombs by Joachim Trier, In Competition last year. From Manhattan in 1979 to Irrational Man in 2015, this will be the fourteenth Out of Competition selection at Cannes for the American director, screenwriter, actor, writer and comedian. Woody Allen was born in New York on 1 December 1935 into a Jewish family of Russian-Austrian descent. A prolific film-maker for the past forty years, directing virtually a film a year since the 1970s, he is also a jazz clarinettist. His career in film began in 1965 with What’s New Pussycat? which he both wrote and acted in. Then came his directorial debut - What’s Up Tiger Lily? - in 1966. He soon began to star in his own films, going on to win four Oscars (for Annie Hall in 1978, Hannah and Her Sisters in 1987 and Midnight in Paris in 2012). He has been nominated twenty times for the famous award, which he has never turned up to collect. Manhattan, Match Point, Take the Money and Run, Vicky Cristina Barcelona, The Purple Rose of Cairo and Deconstructing Harry number among his other successes.